Hong Kong is a great city, its fast, its organised just with the right amount of chaos to remind you you’re in Asia. This was the kids first visit to Asia so on arrival they were a little bit overwhelmed. We had stopped for one night in KL but the hotel was close to the airport and we caught taxi’s there and back. Luckily enough I had been to Hong Kong in 2013 so was able to confidently navigate our way from the airport to our accommodation. I wanted to provide the kids with an authentic experience so I was hell bent on them catching public transport everywhere we went- to the detriment of my sanity! I’m happy to report that I achieved my goal on that note. There are so many exciting things to do in Hong Kong with kids. Of course this is number one. 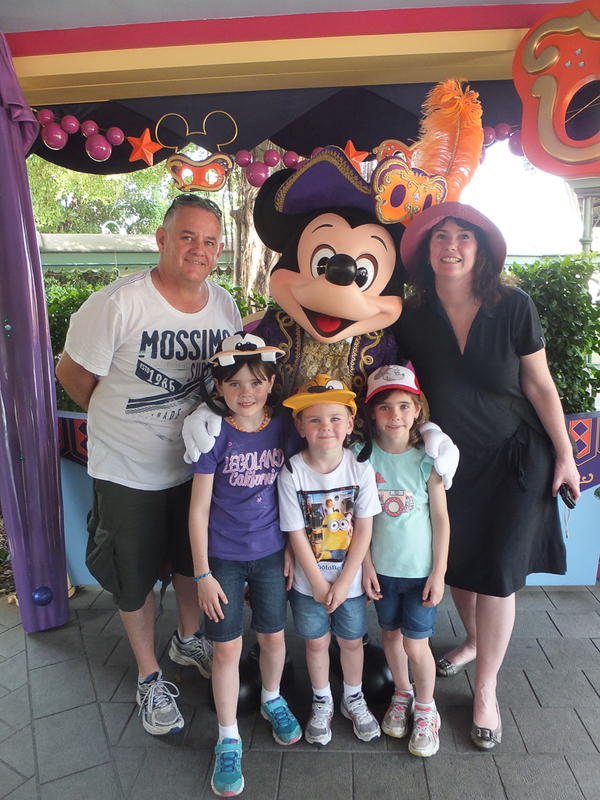 The kids loved Disneyland and they had a wonderful time. We stayed there from open to close and the kids went on just about every ride. There were very few height restrictions which was great for our small kids. The day we visited was very hot with high humidity and we were expecting massive lines and wait times for the rides. This was not the case, even though the park seemed really busy, we never waited more than 30 mins for any of the rides which I thought was pretty impressive. I had expected the 1 hour plus waits that you hear about at other Disney Parks. I was a bit surprised that the queues for photos with the characters was about 40 mins. We split up and had an adult in each line and ferried the children to each character as required. We got a few dirty looks but hey, won’t see them again! Disneyland does a one payment option for photos and as long as you are happy to view your photos later from a website with a password that is provided, you can really save a lot of money using this option. We visited Disneyland with my sister and her husband and as they were part of our group their photos also went under our one payment which I think is pretty good value. We had 30 photos all up on the website when we accessed it the next day. The candid photos the photographers snapped as the kids walked up to the characters where also included. Disneyland is perfect for the younger age group from babies until about 10-12 years old. You can read my post on Hong Kong Disneyland for a more in depth review. Studying the Ocean Park map, where to next guys? Ocean Park is a very close second according to the kids. Ocean Park is a theme park/ zoo all in one. The roller coasters are really impressive, nothing like anything we have here in Australia. Craig and my brother in law had a great time on all the roller coasters. I do think that this theme park is focused more for the teenager and above age group as our kids hardly made the height restrictions. The most common height restriction was 132cms which meant that both our younger kids did not meet this requirement which was particularly upsetting for Keira who was old enough to want to go on some of them. The animal enclosures are amazing and certainly worth the visit for young ones. If you have little ones you could easily spend all day here just wandering around looking at all the animals. This is why I suggest that if you have the opportunity to go to both I highly recommend you do. The light show at the end of the night is great as well, just make sure you are not too close to the front, you might find it a bit warm. The kids enjoyed the cable car ride from one side of the theme park to the other. I on the other hand was thinking it could do with a refurb and hoping it went just a little bit quicker! Brave old mum! You can read my full post on Ocean Park Hong Kong for further details. I also completed a post comparing Hong Kong Disneyland and Ocean Park Hong Kong. I find I often get asked that question by people who don’t have enough time to visit both. Really hot sunny day made for an amazing view. The Victoria Peak Tram is a must do for all ages when in Hong Kong. The views from the Terrace 428 viewing platform are nothing short of breath taking. I did the Peak Tram on both my visits to Hong Kong and if I returned again I would do it again. It was a completely different view both times, the first time it was really foggy and you were unable to see across to Kowloon, this time however it was very clear and I could see much further down the harbour and across to Kowloon. If you have all the time in the world I also suggest you do it by day and night! We only took the kids up there by day and they actually stood for a little while and took in the view, I was impressed! It was very busy and hot, this made it difficult to get a decent photo as the kids were a bit frustrated with the heat and the crowds were a bit overwhelming for them. Craig and I returned one evening, my sister gave Craig and I the night off and looked after the kids for us – awesome! We had dinner together at Aqua on the 29th floor of One (1 Peking Rd, TST) and then caught the Star Ferry to the Victoria Peak Tram. Unfortunately on this occasion we missed out on going right up to the Terrace 428 viewing platform as we arrived after 11pm. The Terrace 428 closes at 11pm but the last tram is at midnight. It was still a lovely view from in front of the Peak Tram stop but I suggest you get there before 11pm to make sure you get up to the viewing platform, its well worth it. You can read my earlier post on the Victoria Peak Tram for a detailed review. Temple St Market, bartering central! Temple Rd Market and the Ladies Market are great for the kids. This is were you get all your cheap Chanel and Gucci handbags and Quiksilver and Billabong t shirts for a fraction of the prices back at home…..! Great place to get tacky gifts and also to practise your bartering skills, my sister says ‘bartering’s a sport’ and my god she’s should have a gold medal in it! Our kids had never bartered before and Alannah was quite interested in the process. I have been told that you should start at a quarter of the requested price and barter up to about half and that is a fair price to pay. I am not the best at bartering but in the end if you are happy with what you paid then you have done well. Don’t worry about what the next person paid. You will know if you have got a bargain as they quickly become unfriendly! Practice makes perfect in this sport I think! Note, Stanley Market does not barter, prices are what are stated and don’t bother trying to barter. At one of the stalls I even tried a slightly cheaper price for purchasing 2 items and they wouldn’t even come to the party to sell 2. There are so many street markets in Hong Kong where you can find almost anything you want to buy! The kids favourite restaurant for dumplings. This was by far the kids most favourite thing to eat in Hong Kong, in Asia actually! They loved all the dim sum restaurants and ate at them most days. I was reluctant to put this in the top 5 but Alannah insisted that it must go in. We ate dumpling whenever we could. I think you could go as far as saying that we ate dumplings every day. We found a great dumpling restaurant across the road from our apartment on the 4th floor of The One shopping complex on corner of Nathan & Granville Rds. We ate at this restaurant twice and they staff were fantastic with the kids. It probably wasn’t cheap by Hong Kong standards but the dumplings were beautiful and the kids ate their body weights in them! Dim Sum can be found everywhere even in some of the Hong Kong cafes located all over the city. We also visited another dumpling house called the Star of Canton. Its on the 24 floor of iSquare on Nathan Rd. The dumplings were delicious but the service was terrible. No one spoke English and they pretty much ignored us which made it very difficult. The place was packed to the rafters and we were the only westerners in there. We managed to get a table in the window and with the great view and the delicious dumplings I still think its worth a visit – service is overrated really, when you have an awesome view! I can laugh about it now but that was the day after our big day at Disneyland, everyone was tired and Craig and I had been niggling at each other as the kids were being a bit difficult. He was frustrated because the elevator was taking forever to arrive so he took off to take the escalators and I waited for the lift. Of course I was at the restaurant first waiting for him and I didn’t know where he was. I then was getting annoyed with his impatience not waiting for the lift as I had obviously got there first, and now I had to wait! Doubled all that with the poor service and lack of communication skills it was an interesting meal! Lucky the restaurant was licenced and the waiters understood 2 Tigers please! A beer at lunchtime fixes most problems. First world problems, I laugh about it now! I could add quite a few more things here for example the Star Ferry, Mid Level escalators or the Big Budda but I wanted the kids to choose and this is what they wanted as their top 5. 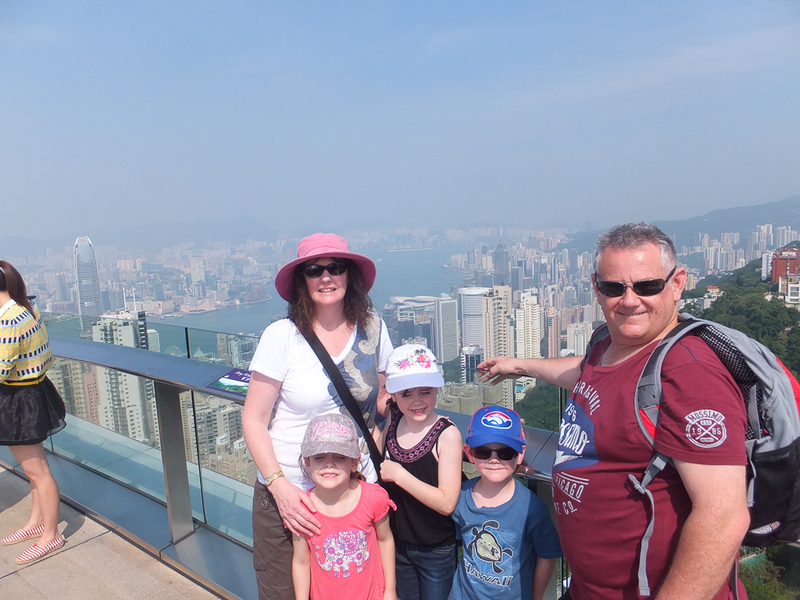 Have you been to Hong Kong with your kids? What were their favourite things? Please let me your comments in the comments box below, I would love to hear what your kids loved and add their ages for me too please. Have you visited Hong Kong with kids? Have I missed anything you think I should include or put on my list for our next visit? Please leave a comment in the box below and I will update this post. ← Disneyland or Ocean Park – which is better? I absolutely love that eating dumplings was the kids’ favourite thing of all!! I think my son would be the same. Hong Kong was my first trip abroad a lot of years ago (I was 9) and I loved it then. Keen to take my 4yo soon! I have such fond memories of Ocean Park – I went for my 9th birthday, actually. Thanks for your comment. Gosh I think you will notice a change in Ocean Park then! It really is a super park. Your 4 yr old will love Disneyland and as it is focused for that age group there will be plenty for him/her to enjoy. My kids loved Hong Kong and enjoyed every minute of it. in 2015 the plan is to take them to Singapore to go to Universal Studios and the new LEGOLAND, I think they will love that too. Have a look at my posts on the elephant sanctuary in Kuala Lumpur and the orangutans in Borneo, both great things to do with the kids.